A film can only paint in broad-brushstrokes; there’s simply not enough time to explore a complex scientific subject in great depth within the format of a 60 minute documentary. To provide a more nuanced and detailed argument, we needed to write a book. Our book is an exploration of the latest science on why vaginal birth and exclusive breastfeeding is so critical for a baby’s lifelong health. It draws on our extensive interviews with key scientists working at the front-line of microbiome and epigenetic research with the aim of presenting complex science in a way that is easy-to-understand and accessible to all. The book is aimed at those who most urgently need the information provided; expectant parents and the healthcare professionals that support them. We wanted to outline the problems and offer practical steps parents can take to protect their baby. The format uses easy-to-follow chapters including important questions any parent-to-be might have, as well as summaries and QR codes for video clips. Most importantly, we wanted to offer parents an important tool for empowered decision-making—and a crucial new perspective on microscopic events that can impact a baby’s lifelong health. There are two editions of our book: The Microbiome Effect is the UK edition published by Pinter & Martin, and Your Baby’s Microbiome is the North American edition published by Chelsea Green. There are a few minor editorial differences between the two editions. 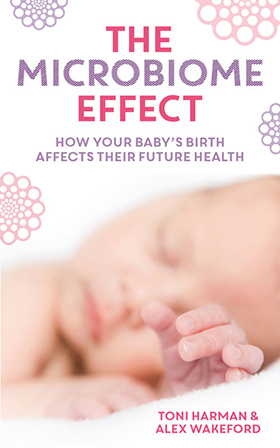 Use the links below to buy The Microbiome Effect or Your Baby’s Microbiome. Very few pieces of research have the undeniable potential to change the future of health everywhere in the world, but Toni Harman and Alex Wakeford’ s work definitely has. In my opinion The Microbiome Effect is a seminal publication in the new field of microbiome and epigenetics. The conversational style and clear explanations in Your Baby’s Microbiome by some of the world’s leading scientists and maternity care providers make this new and complex information accessible and inspiring to the general public. For expectant families, this is the must-read book of this generation. As an advocate for parents, focusing on how the maternal environment changes the long-term health outcomes for the baby, this book is adding a critical piece to the puzzle of health for our children. The ‘seeding and feeding’ of a child’s microbiome could potentially be one of the most important lessons for parents. This timely information should be included as part of every childbirth education and newborn care class. Your Baby’s Microbiome will help parents truly make informed decisions about how and where they give birth and how they feed and care for their baby. It is a must for every woman giving birth. IBCLC, CLE, CLD, CCCE, Co-author of "The Attachment Pregnancy"
My eyes opened wide at Toni Harman and Alex Wakeford’s documentary MicroBirth, and now their book invites you deeper into understanding the problem, the science, and the solutions calling us into action. 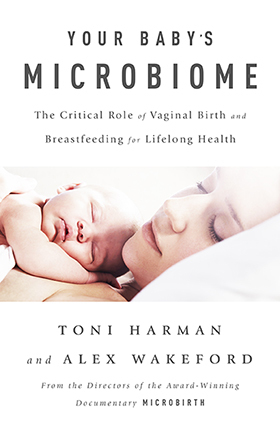 Your Baby’s Microbiome is essential reading for every expectant parent, grandparent, and anyone who works with or cares about childbirth, and the health and well-being of the next generations. I hope this extremely useful and informative book will be widely distributed and widely read, and that its findings will change birthing practice in this country and around the world!